I have to say, it does seem slightly off kilter to bring someone into your home, have them buy your food, cook your food and essentially raise your children and then treat this person doing all of this like a second class citizen. If that. I can only imagine that this is the sense of power that is felt by the oppressor, since the oppressed have no power. Even still, given that situation, I’m of the mind that I would treat that person raising my kids and cooking my food with a little more respect, but then I’m not a 1960’s, Jackson Mississippi racist caricature such as the kind we got in this civil rights era film ‘The Help’. So it’s the early sixties, a turbulent time for race relations to be sure… unless you happen to be in Mississippi where they have everything pretty much under tight control. We are introduced to Eugenia Phelan (Emma Stone), playfully called ‘Skeeter’ by those who know her, and who is fresh from Ole Miss with a Journalism degree in hand, and ready to make her mark on the world. Skeeter lands a gig answering a cleaning advice column for the local rag, but she needs something more hard hitting if she’s going to catch the eye of the bigwigs publisher in New York, particularly Miss Elaine Stein (Mary Steenburgen), editor at Harpers Bazaar. Then after hanging out with some of her southern belle friends and observing the way they treat their maids, she has the epiphany of telling the story of the maids through their own eyes. The problem with this is that this is 1960’s Mississippi and no maid with any good sense is going to speak to Skeeter, because the powers that be frown heavily on colored folks speaking about civil rights or the sorry state of their lives. In fact, it’s against the law. Seriously. But there is Aibileen (Viola Davis), the maid of Skeeter’s childhood friend Elizabeth (Ahna O’Reilly), and while Aibileen is plenty fearful to be sure, she has seen enough and experienced enough to tell Skeeter her story, at great personal risk to the both of them. Miss Hilly Holbrook (Bryce Dallas Howard) and her relentless approach to keep Jackson Separate and Unequal. Then after Miss Hilly fires Aibileen’s best friend Minny (Octavia Spencer) and blackballs her from getting another job, which has made things real difficult for Minny back at home… that damn Leroy… Aibeleen has decided that change has to come. But change doesn’t come easy, plus Skeeter is dealing with her own issues such as her cancer stricken mother (Allison Janney), the sudden and mysterious departure of her own beloved caretaker Constantine (Cicely Tyson) and she needs a man because it 1960’s Mississippi and society has dictated that women around this time needed a man. What Skeeter really needs is more than one maid to find the courage to talk to her. Ah, here comes Minny, who has her own rather disturbing set of stories to tell. What Skeeter really needs in more than two maids to come and talk to her. I’m thinking that’s going to happen, I’m also thinking there’s going to be a book published and I know for a fact that Miss Hilly will not be happy about it. That much I know. ‘Cause she’s a racist. I’m listening to NPR one morning and one of the actresses in this movie was discussing this film, describing how they had to make the audience feel ‘uncomfortable’ at times to get the point across. Well… not so much. While ultimately I thought ‘The Help’ was a good movie and one certainly worth seeing, at no point did I ever feel uncomfortable while watching it, except maybe when Miss Hilly was eating that pie because I knew what Minny had done to that pie long before she told us. In fact, I would almost say that director Tate Taylor went out of his way to put us at ease with this incredibly difficult time in American History and gave us Civil Rights Lite. 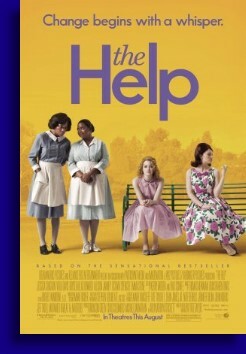 Mentioning that ‘The Help’ is a relatively safe Civil Rights film is more of an observation than a criticism, because it is still effective for the kind of movie that is, that being a film of the triumph of the human spirit. There is tougher stuff out there in regards to the Civil Rights movement, if that’s what an audience is looking for, watch Spike Lee’s documentary ‘4 Little Girls’ if you want to watch something that’s going to bring you to your knees, but for what it is ‘The Help’ is a fine drama. The reason ‘The Help’ works as well as it does it due the performance put forth by the four women in charge of this movie. Viola Davis… who is so talented that it’s frightening… gives this film its slow burning, controlled intensity. Octavia Spencer, finally given an opportunity to have a major role in a major film, takes a hold of this movie and never lets go, leaving her co-stars scrambling to get their movie back. Young Emma Stone serves as our guide and Bryce Dallas Howard has the completely thankless task of representing the entire racist south of the 1960’s. While Miss Howard is the only one of the four women not given a real character to play, with Miss Hilly being something along the lines of a Super Villain, Bryce Dallas did run with it, and Miss Hilly and her nonsense did make this movie go. With the likes of Cicely Tyson and Sissy Spacek hanging in the background for support, spectacular support considering the small roles that they were given, it is the performances of the female dominated cast that makes ‘The Help’ a movie worth seeing. No, ‘The Help’ isn’t as hard hitting as one would have you believe and if you are over the age of twenty chances are it won’t make you all that uncomfortable either since you’ve probably seen ‘uncomfortable’ civil rights movies before this one, but on the strength of the performances alone, including Bryce Dallas Howard’s racist version of Lex Luthor, it is still a movie that was well worth my time.